Female fronted heavy metal band, TEMTRIS, are bound to release their upcoming 5th studio album “Rapture”. The album will be out in Australia on 1 October and worldwide on 2 November via Battlegod Productions. 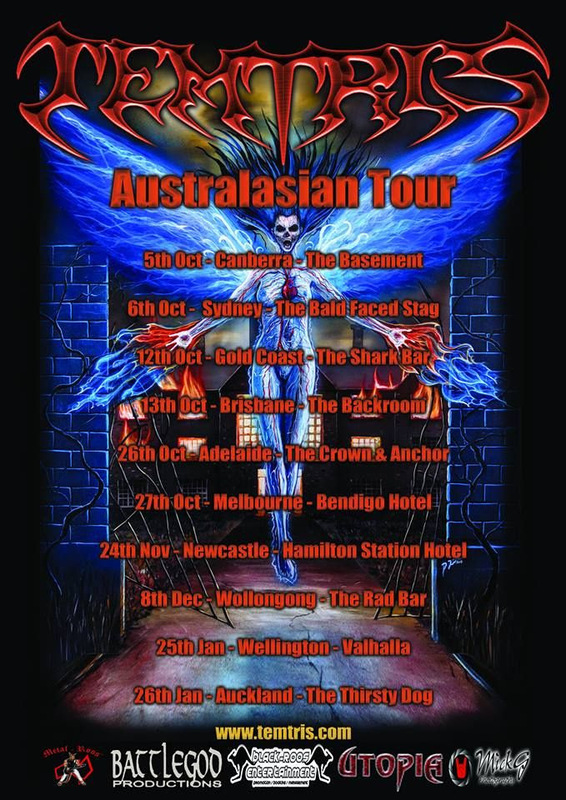 The band will then tour Australia to present their album to the Australian metal heads. The tour starts in Canberra on 5 October and TEMTRIS will play shows in Sydney, Gold Coast, Brisbane, Adelaide, Melbourne, Newcastle and Wollongong before they head over to New Zealand for another two shows. The new album, “Rapture”, is by far is there most uptempo’ed album to date. It captures the true essence of what Heavy Metal is all about. Genevieve’s vocals are a major highlight and the musicianship is far more advanced then their previous albums. The band has recently released their single “Run” from the new album. The single is now available on a limited 7 inch vinyl press with the B side having the song “Paradise Road” from the first sold out TEMTRIS album, “Threshold”. The new single is available for download and purchase on their website www.temtris.com. The vinyl can be ordered at the same website and presales of the album are hosted there as well.